We have Superior Sheds. Our Sheds have a 180 mph wind rating 3/4″ tongue and groove floor and more. From our Bungalow all Aluminum exterior to our Country Inn with multiple exterior options we have you storage shed needs covered. Combining form, function and appearance we can be sure to have a shed to fit your needs. 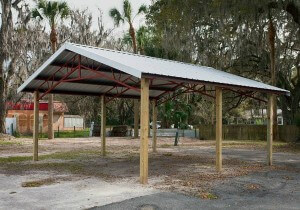 Our Carports are locally manufactured and have 2 different wind load ratings. with Steel panels that carry a 40 year warranty and 17 colors to choose from. We can offer Carports in a variety of configurations from fully to fully enclosed and in between. For our livestock owners or anyone that needs a pavillion we have Pole Barns! Our Pole Barns use red iron trusses and steel “Z” purlins. This allows us to go up to 40′ in width and virtually unlimited length and only requiring 1 truss every 20′. No more sagging purlins and wavy roofs.